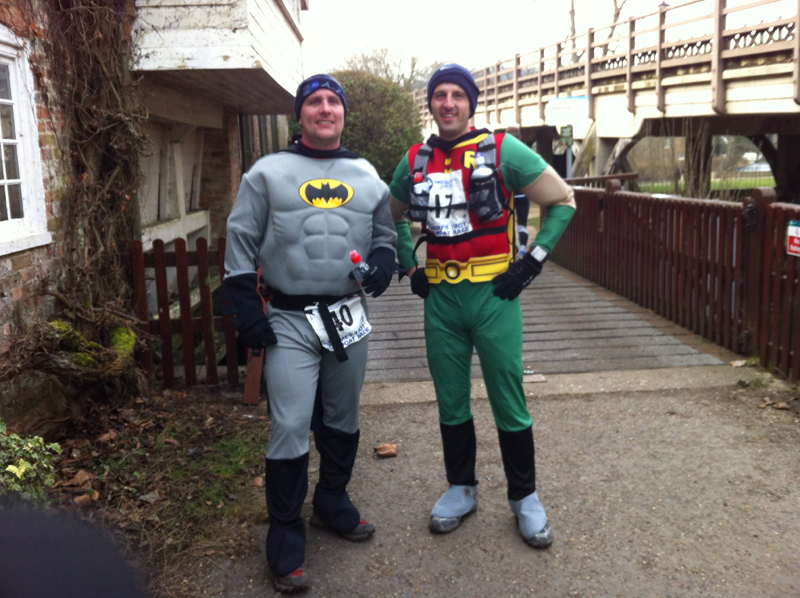 Stouty and I took part in the Thames Trot race a (just under) 50 mile run from Oxford to Henley following the Thames river. 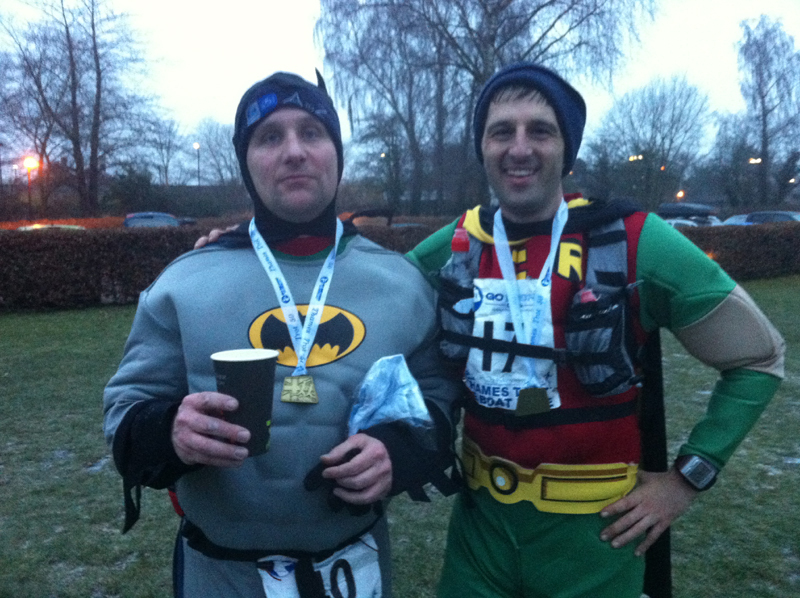 For us, this was also our first fancy dress themed run in support of our nominated charity Cruse Bereavement (www.justgiving.com/runsuperherorun). We arrived at the Prince of Wales Pub with fellow runner Sue about 8am with the temperature at a very cold -8 C. We registered and said hello to a few familiar faces and shared a bit of banter with others as we waited for the race to start which was delayed a few minutes as the last few people registered. We set off along the river with expectations of a 9 – 10 hour run. I did 9.16 the previous year and despite probably being a little fitter than at the same point last year thought the slightly cumbersome costumes would slow us down. We made a fairly brisk start after the slow first mile as everyone crossed the locks and were setting consistent miles of around 8.30 – 8.40 until the first checkpoint. The cold weather had made the ground very firm and very runnable and despite the cold temperatures, it was great to run along the river in these conditions. We arrived at the first checkpoint at about 10 miles in Culham but only paused briefly to swig some water and eat a mouthful of cake. I hadn’t really drunk any of my own liquid, perhaps the cold conditions had affected my thirst. As a point of interest a fellow runner had mentioned the pipe of his hydration pack had frozen and he had been unable to take any water on board so I was thankful the option of taking a couple of bottles in my newish (Xmas present) Raidlight Olmo 5L. The pace was a pretty solid 8.30 – 8.40 as we headed towards the second checkpoint at Benson (19 miles) and here we stopped for a few minutes to take a gel and have a drink. I spent a minute or two faffing with my backpack here which was awkward to access with a cape flapping behind me but sorted myself out and we continued on. We said hello to Kevin Mayo who was marshalling having pulled out at the last minute with a nasty cold and he snapped a couple of pics for us including the one below. It was quite noticeable how quickly you got cold after a brief stop and it took us at least a mile or two to warm up as we took a little detour away from the river after Benson. The pace slowed a little from checkpoint 2 to checkpoint 3 although we did pause briefly to meet our buddy runner Nina who was going to tag along from around the 23 mile point. The costumes weren’t feeling too uncomfortable but I found the rounded neck of mine kept digging into my throat and I kept pulling this away from my neck as I planned a few adjustments before the next race. I’ll add a quick hello to Mike who we bumped into, chatted with and ran with most of the second half od the race. Funnily enough I found out he is a fellow parent at my daughters school, small world and all that. We continued our steady pace as we arrived at Checkpoint 3 at Streatley (27 miles in 4 hours and 30 minutes) which was just over the half way point and on schedule. We stopped for some food and to refill our bottles (I just swapped bottles with fresh water) and I recall having a sausage roll, a bag of crips and a gel. Normally, I would be eating and drinking a lot more but felt ok and didn’t worry about it. Stouty started to walk ahead as I was munching my food and I jogged to catch him up before we continued on. Just after the Streatley Bridge, our buddy runner managed a “comedy fall” but was thankfully uninjured and we continued on until we arrived a few hills at Whitchurch where we slowed to a run/walk for a little while as we crossed this area. From that point, we continued our run towards the next checkpoint at Mapledurham but slowed briefly at the cafe beforehand as our buddy bought a couple of cups of tea for us as we were both feeling the cold at this time. We walked the last 1/2 mile from the cafe to the checkpoint at Mapledurham sipping our teas. We didn’t tarry at the checkpoint having already had a walking break before and left the 36 mile point at 5hrs 50mins. We headed onto road and followed this down to the Railway bridge as a few cars beeped their horns and waved at Batman & Robin (or Delboy and Rodney). It was quite amusing to see different people’s reactions as we passed them which ranged from a loud cheer (particularly the canoeists along the river) to an inward smile, to a beep of the horn, to the “double-take” look (i.e. are they really dressed like that?) to the people who see you and blank you and finally to those who give you a look of absolute disgust. Yes, we saw the full range of emotions from people during the run! The next part of the route was getting familiar as it was nearing my workplace and my lunchtime run route and I was quite motivated to continue plodding along. Stouty was slacking a little today and so I gave him a few words of encouragement to gee him along (get an effing move on.. or something to that effect). We plodded along the Thames river as we approached the Boat Club and headed into Reading paused briefly at the MMA/Thames Water building for a gel and a drink before continuing on towards the next checkpoint. I spotted a few supporters at this point. 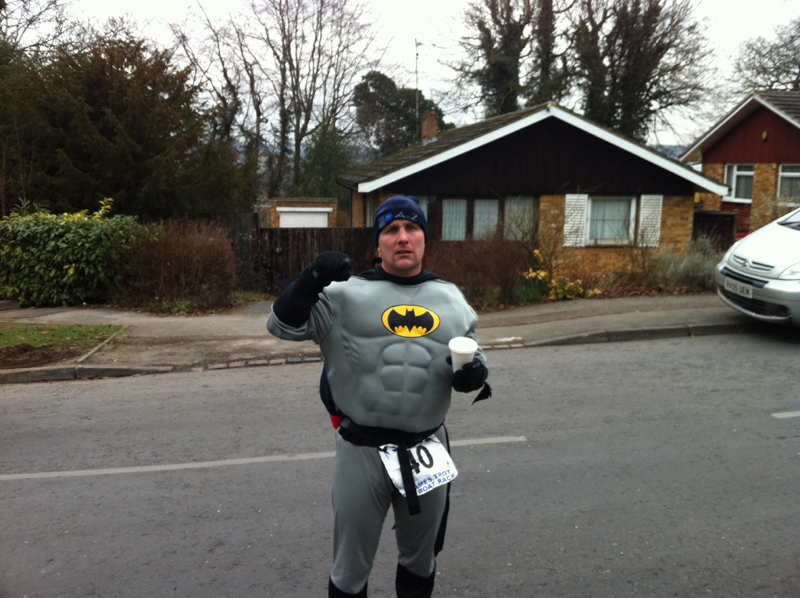 Firstly, there were a couple of Reading Joggers near Rivermead and then I saw Matt Dunn (Fetch Emdee) near Thames Valley business park who was supporting some of the runners and pulled a Superhero pose and said a quick hello before we trotted on. We arrived at the last checkpoint at Sonning and set out again pretty quickly at around 7hrs 10minutes and for the first time (for me) it was still light. With only 6 miles to go towards the end and having run the majority of the route I was on for a massive personal best but would just be over the 8 hour mark. I texted Sue to see how she was getting on and she replied she was only a few minutes behind us and doing well. At this point, I started to edge ahead of Stouty but felt quite motivated to carry on running even at a tired and steady pace and so I drifted ahead of him. Nina stuck with Stouty and so I carried on leap frogging a few people ahead. The last leg felt shorter than it was (perhaps the darkness in previous years had made it feel longer) and despite a couple of walking breaks plodded on in 9-11 minute/miles. With about a mile or two to go, it started to snow as predicted and I jogged along with the odd snowflake falling and the darkness just starting to settle in. A couple of runners came past me just towards the end as I plodded home and before I knew it, I had arrived at the long bridges across the river which marked the last 1/2 mile or so until the end. I crossed the bridge and trotted home picking up the pace slightly and then followed the path until you branched off towards the field and the finish funnel noticing the extra signs and lights they had added this year. I paced myself in to the general applause finishing in a time of 8hrs 6mins which was a personal best by an 1hr and 10mins despite the fancy dress outfit so I was well pleased with the finish time (despite being a few minutes over 8 hrs). As soon as I finished, I started to get cold and so had a sugary cup of tea as Stouty came in a few minutes later in 8hrs 13mins with Sue arriving a few minutes later. Despite the cold weather, it was a good run and we had some good laughs along the way. 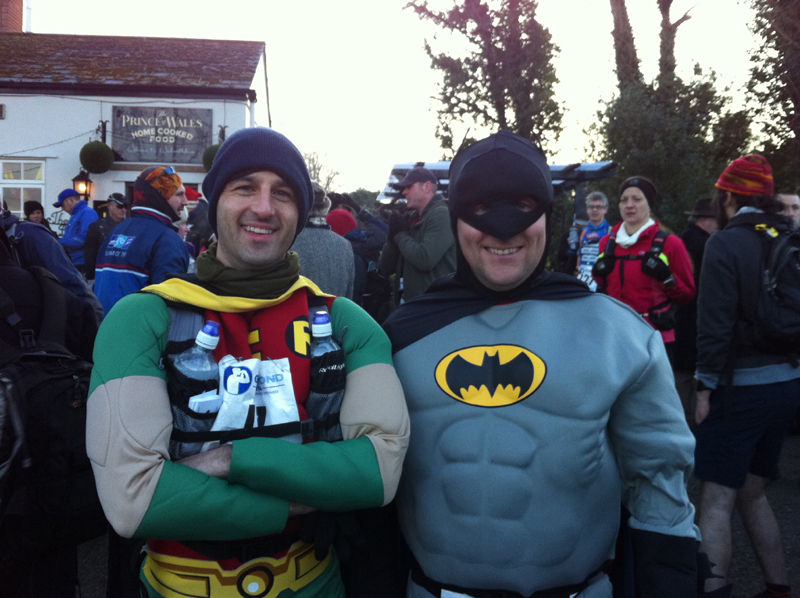 Hopefully, the fancy dressed outfits got a few laughs and a will generate a few donations towards the charity (many thanks to those who have donated so far). On the running front, it was a huge PB for me and probably one of the first Ultra’s I can confidently say I ran most of the race (and was determined to keep plodding along rather than taking too many walking break options) so I’m pleased with the result. As our bags were handed to us, we got changed and watched a few other runners coming in as it got dark and started to snow more heavily and so we decided to head off for a fish and chip dinner and the local chip shop feeling a little sorry for the runners who would still be out there for another hour or two as the temperature dropped even further and conditions worsened. A quick word of thanks to the GoBeyond team and the volunteer marshalls who had to stand around in bitterly cold conditions all day supporting the runners. Without their support, we wouldn’t have been able to run the race so thanks to everyone involved in the event. 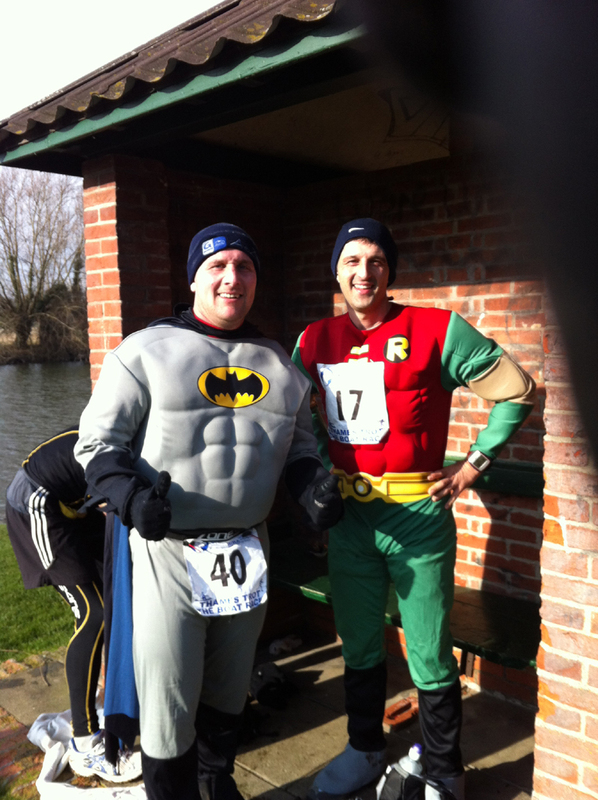 The next event is the Bramley 20 but this is just a training run for the Thames Path 100 which takes place on the 3rd/4th March where Batman & Robin will return.